In the early 1940's von Braun's team studied evolution of the A4/V-2 into a manned rocketplane. The A9 version would have used wings to extend the range of the basic V-2 from 250 km to 550 km. A manned version was also proposed. This boost-glide concept was not strictly a spacecraft -- it would only reach an altitude of 30 km before levelling out for a sustained supersonic glide at 20 km. 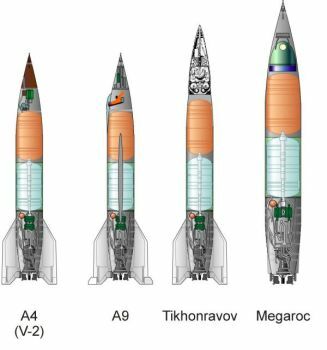 But it would also be a true spacecraft as the second stage of the A9/A10 manned ICBM and A9/A10/A11/A12 manned orbital launch vehicles. The government prohibited all further such work in 1943 in order to concentrate on war production of the V-2. In the fall of 1944, with Allied advances pushing the V-2 batteries beyond range of England, SS General Kammler ordered revival of the concept with immediate effect. A review of the earlier work resulted in final design within weeks of the 'A4b', a prototype of the A9. Five of these were completed by 24 October 1944. The first was flown on 27 December 1944, but crashed near the pad after the steering failed. The second was launched on 24 January 1945. It reached an altitude of 80 km, then pitched over into a stable glide at 1200 m/s. Then one of the wings broke off. The advancing allied armies and supply chaos then ended the program. In the 1990's, as part of the constellation of Nazis-On-The-Moon legends, this last A4b test was said to be a manned flight, not of the A4b, but of the complete A9/A10 ICBM, aimed at New York. It was said that Luftwaffe pilot 'Rudolf Magnus Schroeder' was aboard, and that when the aircraft failed, he committed suicide, biting into an arsenic capsule, crashing into the North Atlantic. This was all nonsense, but put Schroeder in the pantheon of 'Phantom Cosmonauts'. After the war, the idea of putting a man atop a V-2 in order to reach space was advocated in three countries in 1946. In America, von Braun rejected requests from US Army volunteers at Fort Bliss to ride a V-2 into space. In Britain, a substantial modification of the V-2 for the same purpose was proposed and rejected. Most realistically, in Russia, Tikhonravov proposed a manned capsule to be launched by 1948. This proposal was sidelined by Stalin's decision to move V-2 production from Germany to Russia, delaying the program for years. Soviet-built V-2's were used from 1954 to launch dogs into space, but in capsules much too small for a human being. In 1956, Korolev looked again at launching manned capsules atop the R-5 ballistic missile, but decided instead to proceed straight to orbital flight using the R-7 ICBM. In America, von Braun, the US Army, and the US Air Force proposed Project Adam, launch of a Man-High balloon capsule into space atop a Redstone. This again was rejected, although the Redstone idea was retained for use in the Mercury program. A-4b German intermediate range boost-glide missile. Winged version of the V-2 missile with over double the range. Two flown at the end of the war, but there was no time to complete development, let alone start production. Tikhonravov Suborbital Soviet space pioneer Tikhonravov proposed a V-2-launched manned capsule to Stalin in June 1946. Had his plan been approved, the Soviet Union may have put the first man in space in 1948. Instead, Stalin decided to stop the V-2 production in Germany and move everything to Russia. Megaroc In December 1946 R A Smith proposed launch of a British pilot into space atop a heavily modified V-2. The proposal was rejected, and the first British citizen would not fly into space until 45 years later, when Helen Sharman visited the Mir space station.